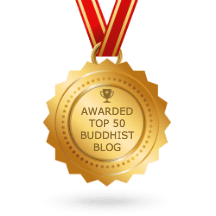 First I must thank-you, so very much, for participating in what amounts to an on-line author reading of your short story collection Buddha on a Midnight Sea for the Buddhist Fiction Blog. While our blog readers are not in your immediate presence to hear you read your stories, your voice comes through them so clearly that I, for one, feel as if I have benefited from knowing you for some time. Second, I’m sure you will join me in encouraging all readers to post their questions about the collection of stories in Buddha On a Midnight Sea to the Buddhist Fiction Blog to engage in conversation with you. I know you are excited to hear feedback. And so we come to the third point, my initial question for authors of Buddhist fiction, which is usually “who is your intended audience?”. Alas, you already answer this question quite eloquently in your preface when you note that you “imagined the stories as a break time activity in the context of a Lam Rim (Stages of the Path) retreat or other less intensive Buddhist religious gathering of several days duration, a relaxation activity to inspire practice even as the reader was entertained, and I still hope someday they may be. But I have discovered, sharing them informally with others over the years, that they are also helpful to those who wish a glimpse of the Buddhist path before treading it, or even just a story that brings some lightening of the heart or a useful idea of two in a time of trouble. I have learned that some of the stories have already been shared in study groups and prisons and even added to required reading lists in college courses” (Hampton, Buddha on a Midnight Sea, x – xi). So my initial question is a bit trickier, I guess: Do you think of your stories as representing or carrying the dharma? If so, how? I look forward to your response and a great discussion about your work. After months of learning WordPress and gathering links and making lists, I am finally “going live” with this Buddhist Fiction Blog. I hope that this blog evolves into a space for conversation and thought about novels and short stories that have been labeled “Buddhist Fiction,” as well as discussion about the label “Buddhist Fiction” itself. In the next two posts I will explore this label, “Buddhist Fiction,” what it could mean and/or represent. In future posts, I will write about works that have been labeled Buddhist Fiction and what they can possibly reveal about modern Buddhism as it is developing in an English speaking and reading context. Until then, sapere aude (dare to know).